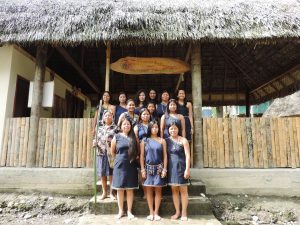 One Woman/One Girl Ecuador Adventure is designed to bring women and girls together from around the globe together to create positive change in our world. We believe that all women and girls are born leaders with incredible gifts to share with the world. This global impact can only be intensified by uniting together, to learn from each other, inspire, create and take action! By attending this amazing trip, you will experience unique interactive activities, cultural enrichment, incredible excursions, life changing experiences, new friendships, and create memories to last a lifetime exploring the beauty and the people of Ecuador. Questions? Please contact one of our WE Travel Team! One Woman is supporting mothers to establish alternative income sources through the establishment of women’s groups. These groups receive support in the form of resources and training to help establish successful business ventures. By improving financial stability, parents feel confident in their ability to pay for fees associated with schooling and student attendance will benefit as a result. Going beyond merely the provision of animals, our economic opportunity includes training, support and workshops, and ensures long-term sustainable solutions to economic challenges. 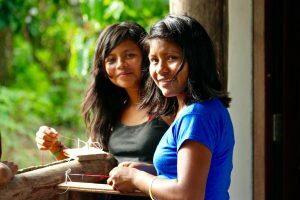 Women now also have the opportunity to develop their skills working on artisans pieces made of natural seeds that grow in their own forests. 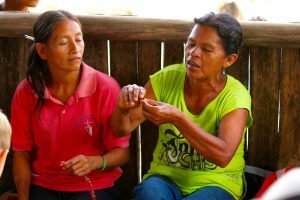 Using these natural, local resources, women produce jewelry, bags, and wallets. Through these income-generating projects, we are empowering women and their families with financial independence. The result is an educated community that is more equipped to life themselves out of poverty.